This oven is an example of a CONVECTION CORE WASH DRYING OVEN, with a (2) two foot wide flatwire conveyor belt. It is a single zone oven rated at 600°F, with a capacity of 6000 lbs. per hour. In this application, Coleman® Jet-Action® nozzles are used to dry core dip, on a variety of sizes and shapes of sand cores. 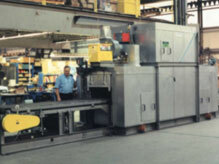 The base oven was modified with conveyor extensions for ease of manual loading and unloading, a variable speed conveyor drive to adjust the cure time, a powered belt cleaner to maintain efficiency, and a part present photo-eye at the exit end of the conveyor to stop the conveyor before cores can fall to the floor. The approximate overall dimensions of this oven are16 feet long X 6 feet wide X 10 feet high. The length of this unit, with extended conveyor, (as shown) is 37 feet.